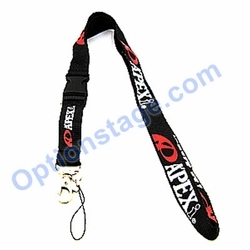 Wear your work badge/school ID/event pass in style with this official lanyard from Apexi. Simple design with Apexi's logo in Red color and White Word. The end is detachable for quick release of your badge. About 20 inches in length. Apexi one of the top auto performance accessories parts company in the world and this collection Lanyard is one of the Must have item. Processing time for an item is the time from when you submit your order to when the item leaves the warehouse. You can usually find an item's processing time when you click "Availability" on the item page. Shipping time is from when the item leaves the warehouse to when it arrives at your door. See shipping times below. Note: We do not ship oversize item to AK, GU, HI, PR, US VI, APO/FPO address and Canada. No Body Kits, Bumper, Wheels, Cat-Back Exhaust System, Rear Spoiler or any item over 70lbs or is not meet the Post Office and UPS shipping rules. Item availablity and Order Process time : 2-3 *business day + shipped via UPS Standard and is in transit for 3-7 business days = Total time for customers to get the products: 5 to 10 business day. Item availablity and Order Process time : 2-3 *business day + shipped via UPS 3 Day Select and is in transit for 3 business days = Total time for customers to get the products: 5 to 6 business day. * The Shipping time will be depend on the USPS and the US Military mail system. Sometime if the package need to resend to other countries and it will take longer time period. Item availablity is 2-3 business day and is shipped via UPS Standard and is in transit for 7-12 business days. The actual delivery time would be 9-15 business days. * For international orders. Shipping rate Does Not include customs clearance. Brokerage charges, duties and taxes. All charges will be billed to the customer. We can only use USA Post Office (USPS) International Priority Mail. The shipping cost will not be same or shown on our web site. Please contact us for the shipping quote. The shipping and delivery time is depend on which country and we will provide the detail information when we give out the shipping fee quote to our customers. All shipping & handling charge may include Delivery Confirmation/Signature Confirmation & Insurance. We do NOT take any responsibility for LOST or STOLEN package situation!!! File your claim directly to the carrier. For any shipment that is refused, you will automatically be charged $5.00 or 10%, whichever is greater, to cover costs associated with processing your order and return. Please go to our Return/Exchange for detail information. Manufacturer warranties vary and are included with your product and should be reviewed carefully for additional information, any defect in the product must be addressed directly with the manufacturer. Please review the manufacturer information you receive with your new product to learn more about the manufacturer's warranty. All parts are intends to be install by professional; all warranty might be void if customers attempt to make the installation by themselves. All warranty will be void if the defect was caused by customers' abuse, negligence and misuse or mishandling. We DO NOT accept any items that is not file the RMA form first and follow the step from our RMA DEPT. Please go to our Return/Exchange for detail Information.